Oxidative processes involved in cryopreservation protocols may be responsible for the reduced viability of tissues after liquid nitrogen exposure. Antioxidants that counteract these reactions should improve recovery. 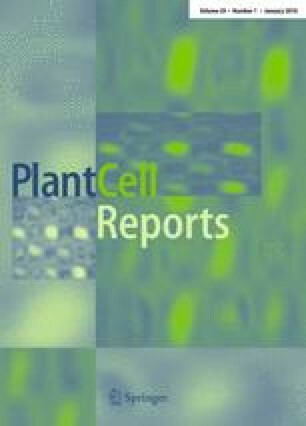 This study focused on oxidative lipid injury and the effects of exogenous vitamin E (tocopherol, Vit E) and vitamin C (ascorbic acid, Vit C) treatments on regrowth at four critical steps of the plant vitrification solution number 2 (PVS2) vitrification cryopreservation technique; pretreatment, loading, rinsing, and regrowth. Initial experiments showed that Vit E at 11–15 mM significantly increased regrowth (P < 0.001) when added at any of the four steps. There was significantly more malondialdehyde (MDA), a lipid peroxidation product, at each of the steps than in fresh untreated shoot tips. Vit E uptake was assayed at each step and showed significantly more α- and γ-tocopherols in treated shoots than those without Vit E. Vit E added at each step significantly reduced MDA formation and improved shoot regrowth. Vit C (0.14–0.58 mM) also significantly improved regrowth of shoot tips at each step compared to the controls. Regrowth medium with high iron concentrations and Vit C decreased recovery. However, in iron-free medium, Vit C significantly improved recovery. Treatments with Vit E (11 mM) and Vit C (0.14 mM) combined were not significantly better than Vit C alone. We recommend adding Vit C (0.28 mM) to the pretreatment medium, the loading solution or the rinse solution in the PVS2 vitrification protocol. This is the first report of the application of vitamins for improving cryopreservation of plant tissues by minimizing oxidative damage. Research was funded by the United States Department of Agriculture (USDA), Agricultural Research Service CRIS project 5358-21000-038-00D. Vitamin E and malondialdehyde analysis was done by the Linus Pauling Institute. Thanks are extended to Jeanine DeNoma for her technical advice and to the Ford Foundation International Fellowship Program, and the University Club of Portland Inc. for fellowships to Esther Uchendu.